Aspe is a small town located in the Valencian community with its nearest neighbouring town being Elche. Alicante is twenty five kilometres away with all of its amenities. Covering a total area of 70.9 sq. kilometers, Aspe is famous for growing a special variety of grapes. The Spanish people would usually eat these grapes on the occasion of New Year’s eve in celebration of the New Year. Aspe is a town on the southern Costa Blanca in Spain with easy access to two international airports of Murcia and Alicante. You can see its location on our Aspe map below. Once at the airport you have a range of different airport transfer options to Aspe including private shuttle buses, taxis or Aspe car hire. Aspe is famous for its grapes, and it is from here that comes the tradition of eating twelve grapes one at a time just before the stroke of midnight on New Year’s Eve welcoming in the New Year. Aspe has a small expat community mainly of Dutch and English origin contributing to the almost eighteen thousand permanent residents of the town. Aspe is a traditional Spanish town with a Mercadonna supermarket and Maxi Dia supermarket. Aspe keeps Spanish business hours meaning that local shops shut at around two have a siesta and reopen again around five until eight pm. Aspe has an indoor market selling fresh fruit and vegetables, bread and meat. Most of the expats are retires and there are few English children and few schools in the area. The British have uniquely set up their own cliques and not integrated into Aspe society. Aspe has been affected by the building boom but at the moment there are many abandoned projects marking the Aspe skyline. Crevillente nearby is known for its textiles and carpets and has many inhabitants originating from North-Africa. Aspe’s local attractions include the old town square or Plaza del Ayuntamiento, church and casino. Much of the old town has also been pedestrianised and Aspe also has its own Campo de Futbol. Aspe has good access to many nearby major towns and attractions. Torrevieja is twenty minutes away by car while Benidorm with its nightlife and theme parks of Aqualandia, Mundomar, Terra Mitica and Terra Natura and Aqua Natura is just over forty minutes away by car. Accommodation in Aspe includes Aspe hotels, pensions, apart-hotels and hostels. There are lots of Aspe rentals with plenty of Aspe apartments for rent and Aspe villas for rent. Aspe restaurants to dine at include the award winning Alfonso Mira. Whether you’re looking for a place to rent or to stay at permanently, you can take advantage of the services from the real estate agents in Aspe who are more than willing to help you in finding your ideal residence. You can contact Janssens Partner (janssenspartner.com, Tel. +34 629 649 856); Inmobiliaria Aspelx (aspelx.com, Tel. +34 965 495 721); and San Jose Inversiones (www.sanjose-inversiones.com, Tel. +34 965 494 311). Aspe is a small town and we are unaware of an official tourist information office in Aspe itself. The nearest ones would be in Novelda or Monforte del Cid – you can get the contact details over on our tourist office page. Alex, what would you say would be the advantages to living in Aspe compared to other Costa Blanca towns? The town of Aspe is located in Alicante. It has been a well-connected town since ancient times, as it is in the natural corridor that forms the Vinalopó River and joined the interior to the coast. This condition allows it to retain features that other cities in their environment have decreased or lost. – It is an active town commercially. – It keeps a quiet high level of tranquility for their neighbors, where you can find a calm and serene way of life without losing the services that any city can offer. – The excellent access to the municipality serves to maintain stable travel times, which means that it has no intense traffic, whether in the village or in the access roads. – The proximity to major cities makes Aspe a dormitory town, where you can live peacefully without the burden of large cities, but where you can also work or pursue commercial and leisure activities easily. There is no major contraindication known. The disadvantage in Aspe, as it is still a very autochthonous town, is referred to public transport services, which are very limited so driving your own car is recommended to move around the area. According to the latest census data from the City Council in Aspe, the percentage of the Spanish population in the municipality is 90%. Besides there is a lot of non-registered foreigners as they have their holiday home in the area. Aspe has places of great scenic and environmental value that can be visited through the municipal network of trails. Other activities which are very popular in the area are golf, ecotourism, gastronomy, culture (Castle Route), etc. Aspe has a health center managed by Vinalopó Salud, whose headquarters is located in the town of Elche, University Hospital of Vinalopó. It also has 7 pharmacies and several dental, physiotherapy, psychological care and elderly centers. Apart from the Central Market, with over one hundred years of history, Aspe has several supermarkets like ALDI, Hiperber, DIA and Mercadona. The selection of shops is quite ample, from hardware stores, greengrocers, kitchenware, to clothing stores, decoration, electrical appliances, etc. One of the advantages of Aspe is its geographical location, perfect to move and explore the area. Aspe is around major cities like Elche and Alicante, as well as charming towns like Hondón de las Nieves and Hondón de los Frailes. Near the town we can also find very special villages with commercial activity like Novelda, Agost, Crevillente or La Romana. It also has universities and colleges in Elche, Alicante and Murcia. If we refer to Aspe particularly, the crime rate is very low. Taking into account the density of the population, it is still a very quiet and hospitable town, where despite only 10% of the population is foreign, they are historically and currently accustomed to receiving foreigners, and even to live with them. It is clear that the property purchase in Spain has increased lately and its value has increased its price in a very low percentage after several years of consecutive falls. Focusing on the area of the Costa Blanca, and specifically in the province of Alicante, currently the market prices are very stable, with a clear expectation that will continue this course. Undoubtedly, it is a good time to buy in this area. 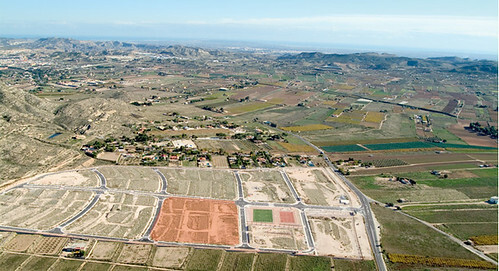 The housing stock offered on the Costa Blanca and in the interior of Alicante is wide. In addition, the offer of foreclosed properties from banks have forced them to reduce the prices by 70% or even 80% since 2008. In the area of Aspe you can find urbanizations as Santa Elena, San Isidro or El Mirador del Alcana. These urbanizations have been recently built. If we try to find some differences among them, basically we would refer to the environment where they are, some more urban and others more rustic. How much are the typical property prices in Aspe for apartments, villas etc? The offer in the town is varied, trying to give a usual price would be difficult. You can find apartments from foreclosures from 30,000 euros up to find villas and chalets that can be around 500,000 euros. Rustic, unique and charming properties can have prices within this broad range or even more. Any tips and advice to people looking to buy in Aspe or surrounding area? The basic and fundamental advice is to let oneself be oriented and advised, both in the process of purchasing and after-sales. It is important to find a professional staff with experience in the area, who knows exactly the details of the legal and civil part of the buying process. This confidence must also be accompanied by professionals who speak your language. Alex, thank you so much for taking the time to help our readers with your experiences in Spain. If you want to contact him, you can find his details below. Here is a video featuring Aspe’s most notable places. Aspe Page Summary – This page contains unique content about the town of Aspe which is set inland on Spain’s southern Costa Blanca, the nearest large town being Elche. This page contains useful Aspe information for people intending to visit or holiday in Aspe. In this tourist guide to Aspe we help visitors who are planning a trip with useful and practical advice on many tourism related subjects such as Aspe car hire, Aspe accommodation, sightseeing, weather, where to go, where to stay, travel information, excursions and what to see and do in and around Aspe. We also have photos, picture galleries, views, videos and Aspe webcams so you can see what Aspe has to offer you for your Aspe holiday. Aspe does have a tourism office which is inside the council house, in the old town square. Also, we do not close the shops to have a siesta. We do it to have lunch (Spanish lunch is at 2pm-3pm) and think that for more than 6 months per year, it is too hot to be walking on the streets, so people stay indoors, therefore the shops are closed because no shop would sell anything. It would bevery useful to have FIESTA DATES AND TIMES. Shown on this site. Lived here 15 years in August and find it difficult to get advanced notice. Friendly police men are the best way of finding out day and time. Ayuntamiento never have enough programmes if any. Always friendly and helpful but rarely able to provide any printed information. What is the address of the crematorium in Aspe?